The nose of Longmorn 28 Year 1985 from The Exclusive Malts is a tad musty at first, but like opening a window in the attic of my soul, or like a beautiful woman nimbly leaping out of a magician’s “She wasn’t really sawn in half!” trunk, the mustiness evaporates like moonlit dew condensing on Eyjafjallajökull‘s lava flow. Light peat, heavy sherry, honey made by killer bees from lilacs, and the casual elegance with which Cary Grant wore grey suits in North by Northwest. Morning glory. Afternoon glory. All day glory. On a par with a Hall of Fame athlete’s career year—pick any sport, any athlete, and fête them with the nose. On the mouth, studded marzipanic buttons, Harry & David® almond tort, carmelized molasses, the hanging twangs plucked from the opening scene of Deliverance (minus the sense of ominous portent, of course). The most glorious 99% butterfat butterscotch ice cream sundae ever conceived. Oaky-fenokee anti-swamp: You’re not mired, you’re exalted, worshipped like a pagan idol by your prostrated palate for the offering you’ve given it. Astonishing. The finish goes from a cello dirge to a lively scherzo, like dropping a small school of ecstasy-dosed sentient lemons on a trampoline made of palm fronds. An exaltation of larkishness, slurred and ennobled. Wow. Words, like for the Emperor Augustus, literally fail me. Sensations rule. I am beyond humanity. 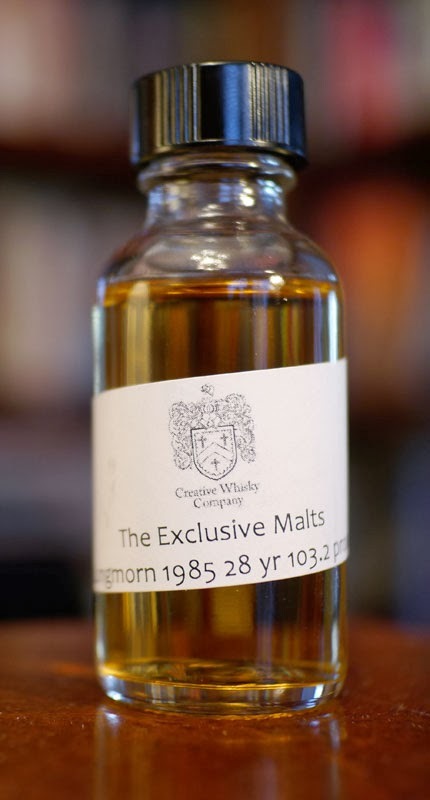 The Longmorn 28 Year 1985 from The Exclusive Malts is the concept of perfect numbers–A perfect number is [Editor: …blah, blah, math, blah…]. The first perfect number is 6. The second is 28. Who cares what the others are?